NOW AVAILABLE ON THE LINE! 📻 Fonzi Neutron One Of The United Kingdom’s Hardest Working Artist and Entrepreneur. Influenced By Originality and No Limit Forever, With Bout Dat Online, Apparel and Music He’s Capturing Greatness In Hip-Hop. Check Out The Hot Vibes…. This Stream Is For The Real…. 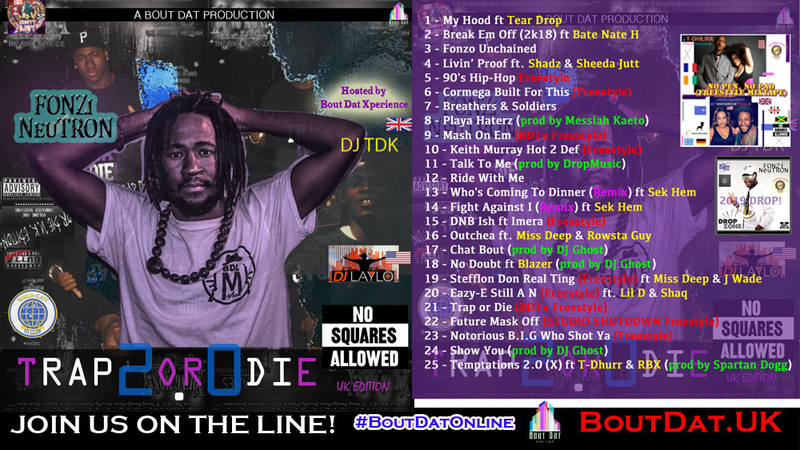 No Squares Allowed Hosted By Miami’, Florida USA Streets Renaissance DJLAYLO and Uk’s Dj TDK…. IT AINT NOLIMIT Forever! Bout Dat Music Group presents the brand new mixtape from FONZi NeuTRON, ‘Trap Or Die 2.0’, hosted by, World Class DJ Club members, DJ Tape Deck King (aka T.D.K) and DJ Laylo! Featuring appearances from Shadz, Bate Nate H, Sek Hem, Miss Deep, Lil D, Shaq, RBX and more!! !